"My treasures do not click together or glitter. They gleam in the sun and neigh in the night." My husband and I just returned from a wonderful trip to Chincoteague to see the wild ponies. We waited to go after the swimming of the ponies because the area is a virtual zoo at that time. October seems to be the best weather with few insects and fewer people! The ponies that remain were easy to spot. Reservations are not necessary at this time of year. We stayed in The Waterside Inn and had a lovely room on the top (3rd) floor overlooking the bay. It was absolutely beautiful. The sunset picture below, I took from our balcony. I would also like to say that we really enjoyed our dinner at The Village Restaurant. I ordered their lobster tail and two enormous tails arrived on the plate. I was mortified and gave one to Bill. He enjoyed oysters on the half shell and scallop salad. The portions were large; the food and service were excellent. The restaurant was built on pilings. We could feel the swaying movement while eating our meal. Bill and I learned much about both of these Islands during our visit. Taken at sunset from our hotel balcony. My Bill enjoying the soft breeze and gentle surf. 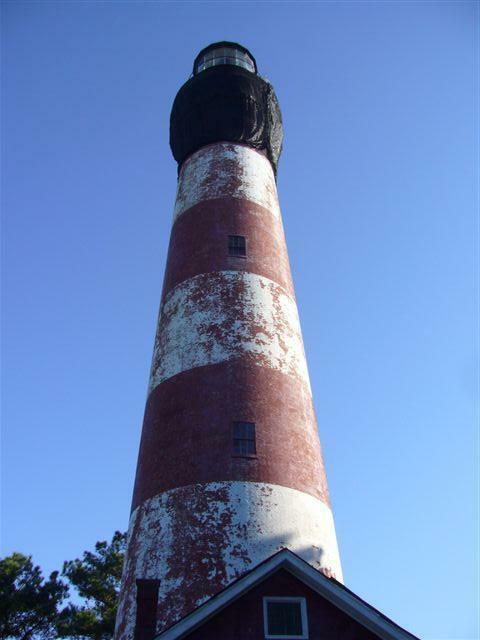 The lighthouse on Chincoteague is under renovation. The information in this article came from Assateague National Park Service website and brochures from The Humane Society of the United States. I did not write it. 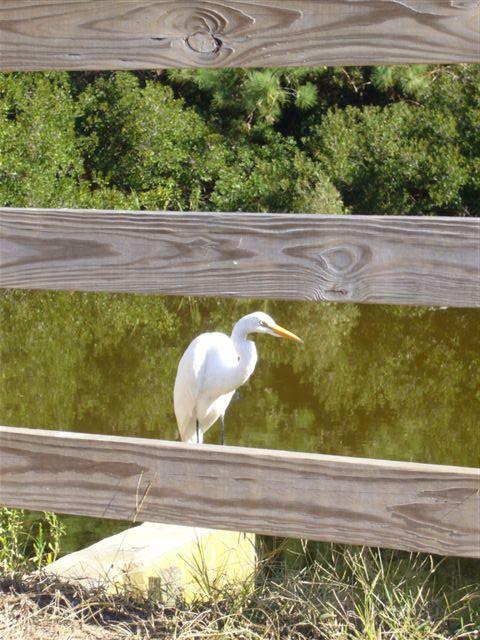 The Maryland Island of Assateague is managed by the National Park Service. The horses are free roaming wildlife and can be anywhere in the park. During the summer months many bands can be found on the beach. You can often see the horses and other wildlife by driving slowly along the park roads. It is also important to note that the number of wild horses on Assateague are managed by being given a non-hormonal, non-invasive vaccine to prevent pregnancy. This vaccine is delivered by a dart to the hindquarters of selected mares each spring. To keep the gene pool as large as possible each mare is allowed to have one offspring. This vaccine has successfully lowered the birth rate of Maryland's horses to fewer than 10 foals per year-enough to ensure a sustainable population. Left to themselves, the horses would quickly destroy the barrier island environment that sustains them. In 1968 Assateague Island National Seashore bean managing its 28 horses as a wild, free-roaming herd. By 1989 the island's wild horse population had reached 142 and something had to be done. The fragile dune and marsh grasses were threatened by the pressure of too many hooves and hungry mouths. Results of a 2005 genetic study of the entire herd wil be used to help the NPS make wise herd management decisions. The goal of the NPS in Maryland is to keep the herd size to less than 125 horses. "Assateague's wild horses are well known, even to many people who have never been to the island. The "wild" horses on Assateague are actually feral animals, meaning that they are descendants of domestic animals that have reverted to a wild state. Horses tough enough to survive the scorching heat, abundant mosquitoes, stormy weather and poor quality food found on this remote, windswept barrier island have formed a unique wild horse society. Enjoy their beauty from a distance, and you can help make sure these extraordinary wild horses will continue to thrive on Assateague Island. Many visitors first learn about the Assateague horses from Marguerite Henry's famous book Misty of Chincoteague. The story takes place during a traditional Chincoteague festival called "Pony Penning." On the last Wednesday of July, the Virginia herd of horses is rounded up and swum from Assateague Island to nearby Chincoteage Island. On the following day most of the young foals are auctioned off. Proceeds from the sale benefit the Chincoteague Volunteer Fire Department. There are few places in the United States where you can view wild horses. Due to their complex social structure the Assateague horses display a wide range of unique behaviors. Take advantage of the opportunity to view these horses in a natural habitat. With careful management, the wild horses will continue to thrive on Assateague Island and provide enjoyment to thousands of nature enthusiasts, photographers, and people who just love horses!" In the summer and early fall, horse-back-riding is nopermitteded in the Maryland portion of Assateague Island National Seashore due to the presence of biting insects known to spread disease, including: Eastern Equine Encephalitis (EEE), Equine Infectious Anemia (EIA) and West Nile Virus (WNV). Day use horse-back-riding is permitted in Maryland froOctoberer throughgh May 14.Duringng this period, it is not considered that there is much danger for the spread of insect borne disease, but it cannot be guaranteed. Visitors must decide for themselves whether the level of risk is acceptable. All Maryland day use riders must park in the North Beach Parking Lot and check in at the Ranger Station. Riders must lead their horses from the North Beach Parking Lot through the Ranger Station employee parking area and follow the sand dune crossing road east to the top of the dune. At the top of the dune, riders may then mount and ride south on the beach within the Over-SanVehicleke Zone. Before leaving the park, it is your responsibility to clean the parking lot and riding area of any manure, hay or feed dropped as a result of your visit. Bring a bucket and shovel to assist in the cleaning area. 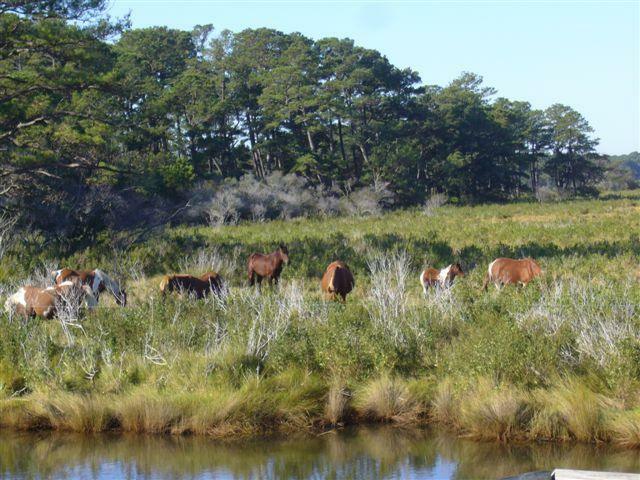 Assateague Island National Seashore operates 2 campsites for horse camping October 16 through April 14. Each site will accommodate up to 6 people and 6 horses. The fee is $25/site/night in addition to the $10 entrance fee for each vehicle. The total camping fee for each night must be received within 10 days of your reservation to hold the site. Horse camping sites may be reserved no more than 6 months in advance. 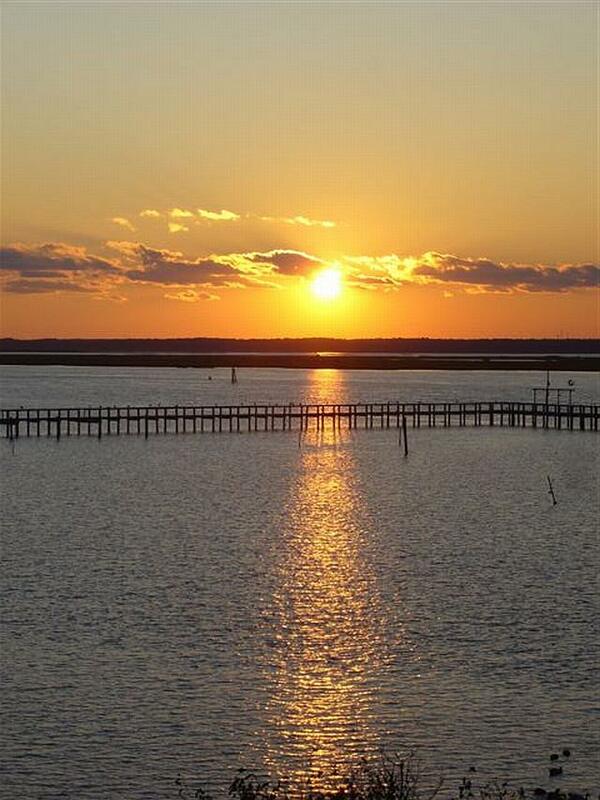 Stop in or call the North Beach Ranger Station at (410) 641-3030 to make reservations. In Virginia, horse-back-riding is permitted year round along thbeach frontnt in the Over-Sand Vehicle Zone, as well as along a limited section of the inside of the Toms Cove hook. However, these areas are subject to intermittent closure for migratory bird nesting. Stop in or call the Toms Cover Visitor Center at 757-336-6577 for more information. In Virginia, horse trailers may be parked in Parking Lot #5. Again, bird nesting activities may require intermittent closures. There are entrance feerequireded for all vehicles entering the park. A 7-day entrance pass ($10), Annual Park Pass ($20Inter agencycy Annual Passport ($80), USFWS Duck Stamp ($15) upgradeInter agencycy Senior Passport ($10), oOntogenycy Access Passport are available fopurchasese by cash, check or credit card. We have a Golden Eagle Pass for Senior Citizens which allows us entrance into any Federal Park. It is good for the rest of our lives. State parks are not covered under this pass. Horse-back-riding is permitted on the beach in the Over-SanVehicleke (OSV) Zone located 1.5 miles south of the Ranger Station. The stretch of beach between the Ranger Station and the beginning of the OSV zone is to be used only as a corridor for entering and exiting the permitted area. In the OSV zone, riding is permitted in all areas authorized for public Over-Sand Vehicle travel. Riders must stay on the Oceanside of the white marker posts. Take care to avoid groups of people engaged in other recreational activities such as fishing, sunbathing, biking, fishing, etc. No dune crossing is permitted other than the sand access leading to and from the Ranger Station. Riders may not access areas posted for official vehicles, back country campsites, the "back trail" behind the dunes, paved roads, public boardwalks or any other unauthorized areas. You can pick up a map at the Ranger Station. What Do the Island Ponies Eat? The horses spend most of their time grazing on abundant but nutrient-poor salt marshmarsh cordgrass, saltmeadow hay and beach grass. The horses' short stature is a result of hundreds of years of adaptation to this low quality diet. Genetically they are considered horses, even though they are now pony size. The Assateague horses drink over twice the amount of water than domesticated horses will due to their salty food supply. All that drinking combined with a high salt diet contributes to their bloated appearance. We parked the car and took this picture. The horses were grazing happily. Where Do They Live Throughout the year? Spring brings cool, rainy weather and fresh plant growth to the islands. Many of the horses live in the marshes close to their best food sources. Foals are usually born in late spring and live with their mothers in a family group called a "band." Each band is usually made up of 2-10 mares, their offspring and a stallion. Hot, humid, and full of insects, summer brings a new set of challenges. The horses escape the mosquitoes and flies of the marsh by spending more time on the beach and in the surf, letting the refreshing ocean breezes carry away airborne pests. Cooler fall weather and fewer insects allow the bands to move from the beaches back to the marshes and their abundant grasses. The horses prefer to browse in shrub thickets during the damp, chilly, winter season. Their thick, furry coats will protect them from ferocious winter winds and the occasional snow storm. In Virginia the horses are privately owned by the Chincoteague Volunteer Fire Department and are fenced in large enclosures. 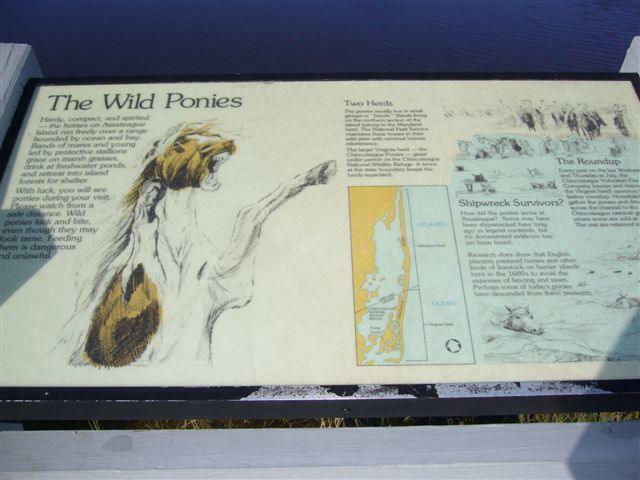 Look for the horses in the marshes along Beach Road and from the observation platform on the Woodland Trail. Proceeds from the sale benefit the Chincoteague Volunteer Fire Department, which is responsible for the care and management of the Virginia herd. Virginia's privately owned horses are kept separated from Maryland's wild horses by a fence that runs across the Maryland/Virginia state line. Maryland's horses are not rounded up or sold at auction. Virginia's privately owned herd produces 60-90 foals every year. Most of the foals are sold at the annual auction, which keeps the number of horses at or below the 150 adults allowed by the grazing permit. 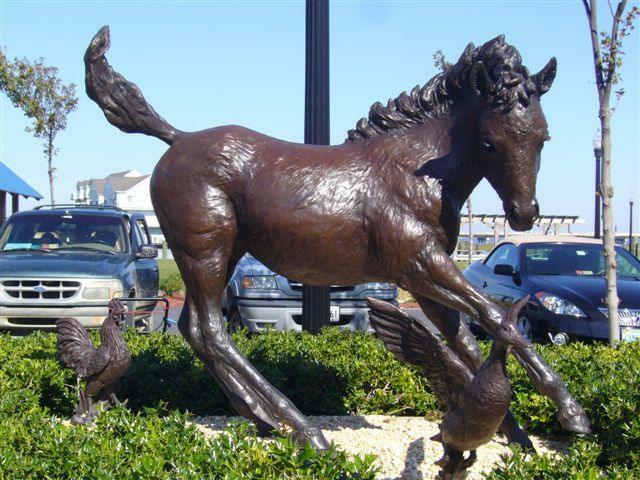 Misty of Chincoteague is the title of a 1947 book by American author Marguerite Henry, based on the true story of a Chincoteague Pony named Misty. Set on the coastal island of that name, the book tells the story of the Beebe family and their efforts to raise a pony born to a wild horse. The book won the Newbery Honor. The pony on which the book was based was foaled in 1946 on Chincoteague Island, sired by Pied Piper, out of a dam called Phantom. Misty was a pinto pony whose coloration included a large patch of white on her side, shaped like the United States. Her hoof prints are in the sidewalk outside the Roxy Movie Theatre in Chincoteague. Misty died in 1972 after spending part of her life at Marguerite Henry's Wayne, Illinois home. Her body and that of her foal Stormy have been preserved via taxidermy and can be seen at the Beebes' home. The following is an article that appeared in the Washington Post Metro Section published July 8, 2011. Follow the link provided to read the exact article and see the images, as well. ASSATEAGUE ISLAND NATIONAL SEASHORE, Md. Park officials say that humans are endangering the wild nature of the iconic feral horses that roam the coastline at Assateague Island National Seashore on the Virginia-Maryland border. "ASSATEAGUE ISLAND NATIONAL SEASHORE, Md. - They scarf potato chips and whole bags of marshmallows late in the night, leaving behind trashed campsites and ruined tents. They break into stranger's coolers and make off with watermelons. They carelessly turn on water spigots and leave them running. Rangers are dealing with a problem that has all the hallmarks of a classic beach-week bender, but the culprits aren't rowdy teens. They're Assateague Island's famous wild horses. Volunteer Phil Gregoli works on Assateague's 'Pony Patrol,' which helps keep wild horses safe on the island. Gregoli patrols roads and campgrounds, keeping visitors a safe distance from the horses and shooing the animals from busier roads. The horses have been mooching food for years, but their brazenness has grown worse in the past few, said Trish Kicklighter, the park's superintendent. Some of Assateague's 113 horses have become particularly fond of junk food and interact with people who bring it into the park. The horses beg. They pester. They even run a hustle that wouldn't be out of place on a D.C. street corner. For the horses, a diet rich in human food could make them sick. Debris such as tinfoil has been found in some horses' excrement. Park officials are quick to place the blame for the horses' behavior on those with two legs, not four. This year, they have rolled out measures to reestablish the boundaries between horses and humans, inspired by national parks out West that have managed bears. Officials have hired a full-time equine chaperone for its Pony Patrol team and instituted a $100 citation for 'willfully' getting within 10 feet of a horse. Previously, there was only a fine for petting or feeding the horses. Park officials said the horses' behaviors undermine the majesty of the animals, which inspired the novel, Misty of Chincoteague. Tourists expect postcard images of horses galloping on beaches and manes aflutter on dunes, not a horse with its head stuck in a bag of Cool Ranch Doritos. 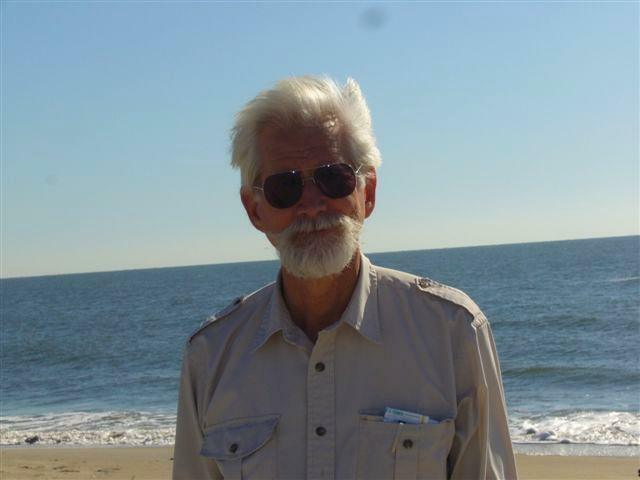 Phil Gregoli is one of the best hopes for keeping Assateague's wild horses wild. With a neon-colored safety vest and walkie-talkie, the retired printer is a member of the park's mostly volunteer Pony Patrol. The patrol spends its days shooing horses off roads, camping areas and more crowded beaches, but the job is as much about herding humans as horses. Gregoli's walkie-talkie crackled often on a recent July morning. 'Horses up on six-one-one,' a ranger radios, referring to the main road onto Assateague Island. Gregoli hopped in a green golf cart to head to the scene but only made it halfway before running into a 'horse jam' - that's park lingo for a backup caused by horses lingering on a road and visitors slowing down to rubberneck. Park officials said many horses have come to expect food from passing motorists, so they linger on roadways. It's one of the behaviors officials would most like to change, because it can be deadly for the horses: The park averages about one car-related death a year, they said. Gregoli jumped out of the golf cart and shooed the horses off the road. He said many of the problems with horses boil down to some visitors' perceptions of the horses as not truly wild, like a bear or moose. Gregoli said he once came upon a man hugging a horse and feeding it potato chips. Park officials said they have seen parents stick a child on a horse's back to get a snapshot. To combat such behavior, a new sign states: 'Horses, Bite, Kick & Charge/KEEP AT LEAST 10 FEET AWAY.' To help keep the animals away from campsites, park officials installed wooden blocks to prevent them from nudging open water spigots. 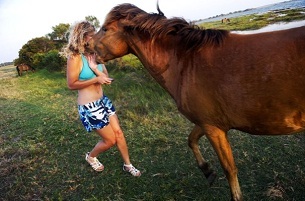 Sally Cohen of Tampa, Fla., who has been going to Assateague for more than 25 years, said she once returned to her campsite to find five horses munching on hot-dog buns she had left out. Another time, she said, a horse rooting around in a tent got spooked and charged off - with the tent around its neck. 'This island belongs to the ponies,' Cohen said. 'They are mischievous little buggers. You almost expect to lose some food or camping gear each time you come out.'"